Set up and configure Chromecast using the Google Cast app on your iOS or Android device, make sure it's connected to the same Wi‑Fi network as your Harmony hub. Once connected, you'll be able to create Activities that include your Chromecast. Start your Activity, which prepares your devices, then start casting from your PC or mobile device. 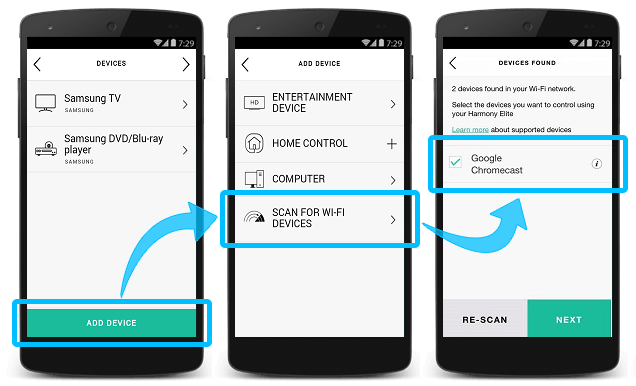 Select ADD DEVICE at the bottom, followed by SCAN FOR WI‑FI DEVICES. Harmony will search for any connected Chromecast devices on your home Wi‑Fi network. Tap to ✓ the box next to Google Chromecast, followed by NEXT. Follow the on-screen prompts to create a Watch Chromecast Activity. 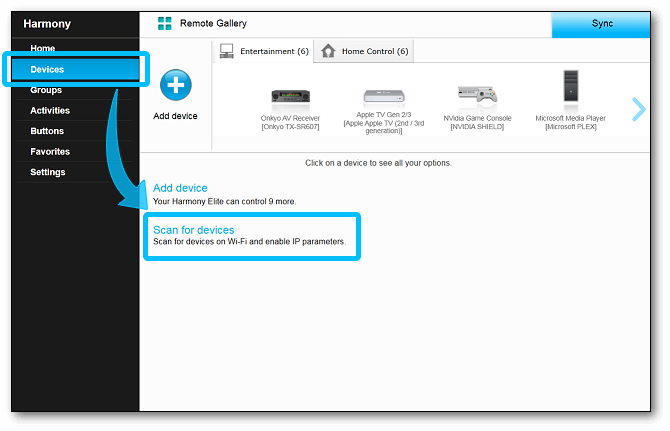 Launch the MyHarmony desktop software, sign into your account and select your remote from the gallery. Select the Devices tab, then Scan for devices. You will be prompted to connect your Harmony to your computer with the provided USB cable. Harmony will scan your home Wi‑Fi network for Chromecast. Ensure both Chromecast and your Harmony hub are on the same Wi‑Fi network. 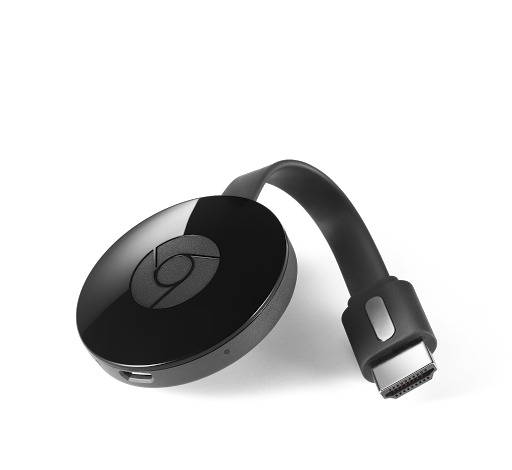 Only Harmony hub‑based products are able to recognize and add Chromecast, allowing you to include Chromecast devices in your Activities. Harmony cannot directly control Chromecast, so casting will need to be initiated separately from your Activity. When casting from a mobile device, you'll need to use that device to control media. Media Keys such as Play, Pause, Stop, Fast-Forward and Rewind commands work. YouTube allows you to navigate between videos using the Skip Forward and Skip Backwards commands. Media Keys such as Play, Pause, Stop, Fast-Forward and Rewind commands work. Plex allows you to move a frame forward or backward using the direction left and right arrows. This may be listed as "Options" or "Options*" on your remote or mobile screen. If you don't see this button, you may customize your remote screen or your Harmony mobile app screen. Harmony Hub connects with Chromecast through your home's Wi‑Fi network allowing you to navigate and control using either your Harmony remote or the Harmony mobile app when using your PC as the media control device. Harmony cannot initiate casting, this must be done manually and separately from your Activity. Please ensure Chromecast is connected to the same Wi‑Fi network as your Harmony hub.